I think it’s fair to say that Reptar’s afternoon set at Wakarusa did not get off to a good start. After butting heads with the sound guys during the sound check, the band’s 4:00 show didn’t begin until 4:40. To make matters worse, just as the four band members were poised and ready to play, the sound guys informed them that they only had until 5:10. Frustration was evident on frontman Graham Ulicny’s face as he approached the mic: “We only have 30 minutes to play, so y’all better dance. We didn’t drive 13 hours for you to sit on your butts.” With that, they began. The tension quickly dissipated as they launched into a sequence of some of the most energetic songs off their recent release, Lurid Glow, such as “Ice Black Sand” and “Cable.” It was easy to follow through on Graham’s plea to dance, as the end of each song was quickly followed by the next, with almost no pause whatsoever for on-stage banter. 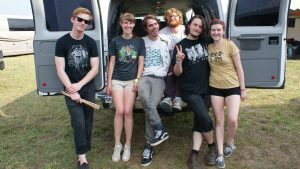 It was evident that the guys of Reptar were not upset with the abbreviated stage time not because of personal pride but because they were there to play music. Even with the brief 30 minutes, Reptar’s intense focus on the music enabled them to hit their stride very soon into the performance. 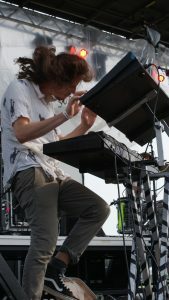 Proof: After the first four songs or so, keyboardist William Kennedy evidently decided the low ponytail he had his long curly hair in was no longer sufficient. 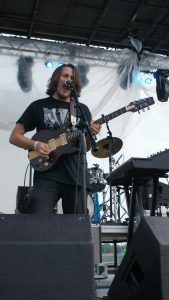 He took his zebra print hair scrunchie (to match his button down shirt featuring pictures of zebras AND his keyboard stand with black and white stripes) and twisted it around a broccoli bun right on top of his head, with the presumed intention of keeping his hair out of his face while playing. As the set progressed, however, William’s dancing, which was at first pretty low-key, grew into a full-body thrash, swiftly bringing the demise of the broccoli bun. Needless to say, it was great fun to watch. For those fleeting 30 minutes, Reptar’s primary concern was consistently the music. And when KHDX sat down with vocalist/guitarist Graham Ulicny and bassist Ryan Engelberger, our interview confirmed that the music is always their biggest focus. One of the things that came up repeatedly in our conversation was the band’s lack of concern over the identity of Reptar. 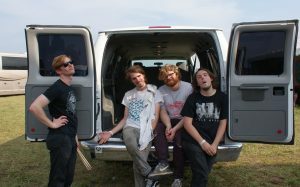 After discussing the formative years of the band, we asked at which point it felt like Reptar as an entity had come into its own. The guys responded by saying they’re never aware of what the band is doing to the point that they can put so many words to it. “We’re not necessarily intentionally charting where we’re going,” explained Ryan. “I feel like I’ve met a lot of people who the physical image of [a] band makes it easy for them to understand the music.” Graham added on that this kind of image makes bands easily marketable, but also one-sided. For Reptar, Graham explained that “it’s more like ‘Oh this is what’s happening because this is what sounds right, what feels right.’ It’s very not contrived, and probably to the detriment of our band… It’s hard when people ask, ‘Well what kind of band is it?’… We know what we’re doing, but we don’t know how to really market that to a greater audience.” This self-criticism, though, was good natured. 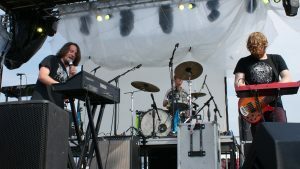 Graham mentioned with a laugh, “We’ve taken press photos three times in seven years.” What’s more, the band likes it that way. While discussing bands that market themselves well, Graham declared, “I don’t want to be great at that,” a statement that Ryan affirmed. The hakuna-matata color to Reptar’s creative philosophy manifests itself in more than simple sounds-good music. Though people often describe them as some sort of branch-off from Talking Heads and Vampire Weekend (which is not altogether inaccurate, just reductive), Anna and I have agreed that we have never heard anything like Reptar. Their music tends to sound like rage, but it takes joy in the very fact that we can feel rage and express it in sound. They can sing about dark and troubling experiences but the musical release of all these edges is, in the end, jubilant somehow. Any band that presents something unfamiliar calls for their own taxonomy, one separate from stamps like “indie” and “alternative” that are more like gaunt corpse-words than information. So, I personally could only describe their music as “primal scream therapy pop.” There’s a certain chaos coming out of their music that sounds all the more cool because it’s in relief against meticulous polyrhythmic undercurrents. This, I think, explains why Reptar can lose their minds in their sounds on stage. Despite the frustrations of sound checks and lugging heavy equipment across state lines, having material instruments affords them a bodily immediacy that is less present in something like a DJ set. Their inspiration for their music is rooted in the undeniably human aspect to playing an instrument: the inevitable spontaneity, the ordered chaos. “Pop music is the only catch-all that I feel comfortable applying to the band,” says Graham, “because all music is pop music. Except for jazz…which was pop for a while.” It’s true, pop means everything and nothing. “Popular” music carries no weight on the individual level, and Reptar’s songs are concerned only with feeling, the individual reaction. “There’s never a conversation of ‘this is the genre we’re gonna perform.’ I mean, pop. That’s what we do. We write pop songs. But they’re our pop songs.” Whether intentional or not, Reptar writing their own pop songs ends up championing their audience too. Reptar bears few similarities to most pop hits of today, yet is inescapably contagious. “Our pop” becomes a shared “our” between the band and every person who participates, who considers the music as their own.